Following on from our last Shuttle barebones system review (Shuttle XPC Cube SZ170R8), we have a slightly different model on the test bench today from the awesome guys at…you guessed it, Shuttle! In contrast to the XPC cube that we previously got to grips with, todays model is much different in terms of features, specification and design. The Shuttle XPC Nano NC015U5 barebones system features an inclusive Intel Core i5 5200U processor which includes support for up to 16GB of DDR3L 1600MHz memory; DDR3L is essentially the same memory/RAM found in notebooks and laptops. It’s no surprise however as this particular system is very small, in fact it’s one of the smallest systems we have seen to date to feature an Intel Core i5 processor, but the main benefit of a barebones system is it allows you to choose the majority of the core parts yourself. 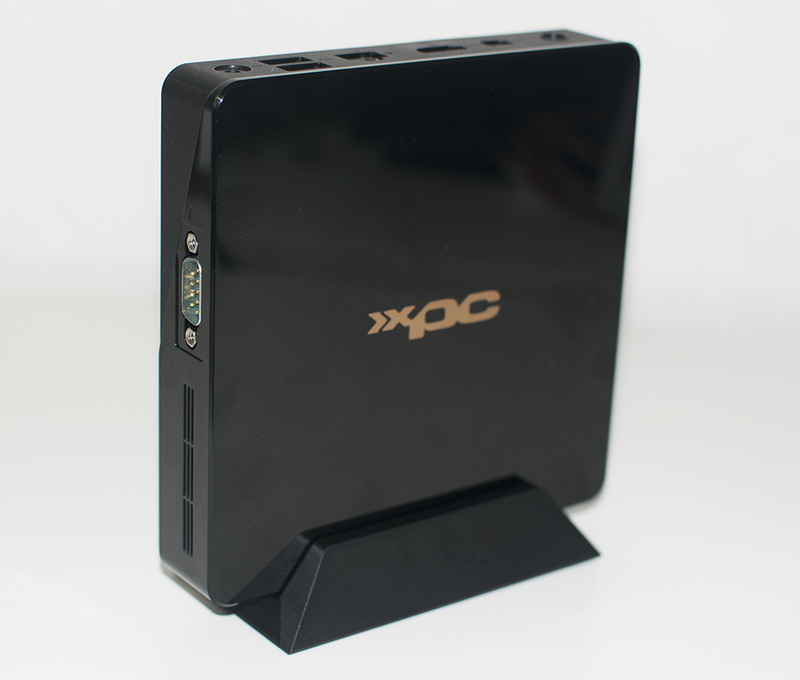 One of the cool features of the XPC Nano NC01U5 is that it comes supplied with a VESA mount meaning that you can attach it to the back of a PC monitor; this reduces the systems small desk footprint even further and makes this small barebones perfect for a small office PC. As we can see from the Shuttle XPC Nano NC01U5 system itself, it’s compact, very small, but pretty damn stylish if I do say so myself. It features an all-black design with bronze coloured accents including the Shuttle logo’s across the unit. In fact touching directly on the size itself, the XPC Nano NC01U5 comes in at a very svelte 141mm x 141mm x 29mm which is very small indeed. 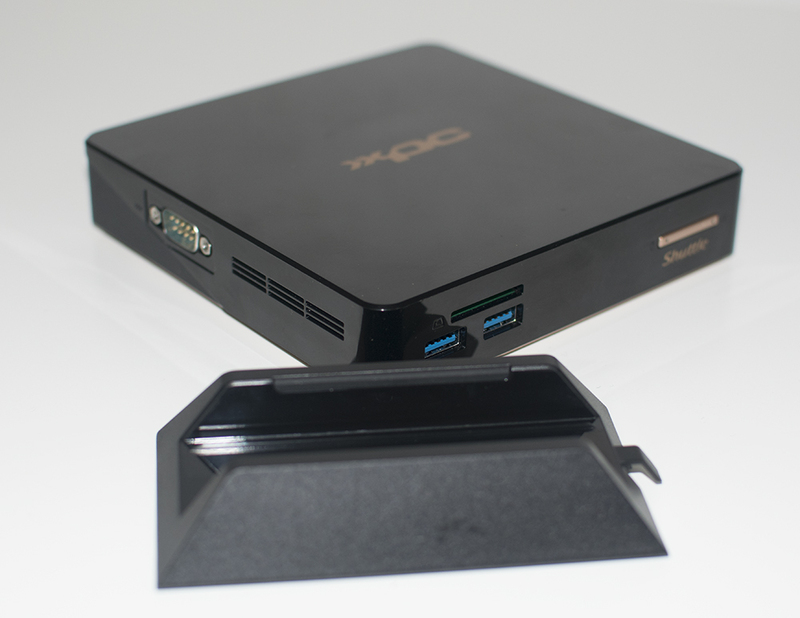 On the front panel, we have 2 x USB 3.0 ports, an integrated SD card reader, and a power button. On the left-hand side (if you assume the picture above is the front), we have a Serial RS232 COM port or as they are more widely known, a 9 pin D-Sub connector. There is also some subtle, but useful ventilation featured too. At the back of the NC01U5 barebones system, we have the majority of the connections; as you would expect. 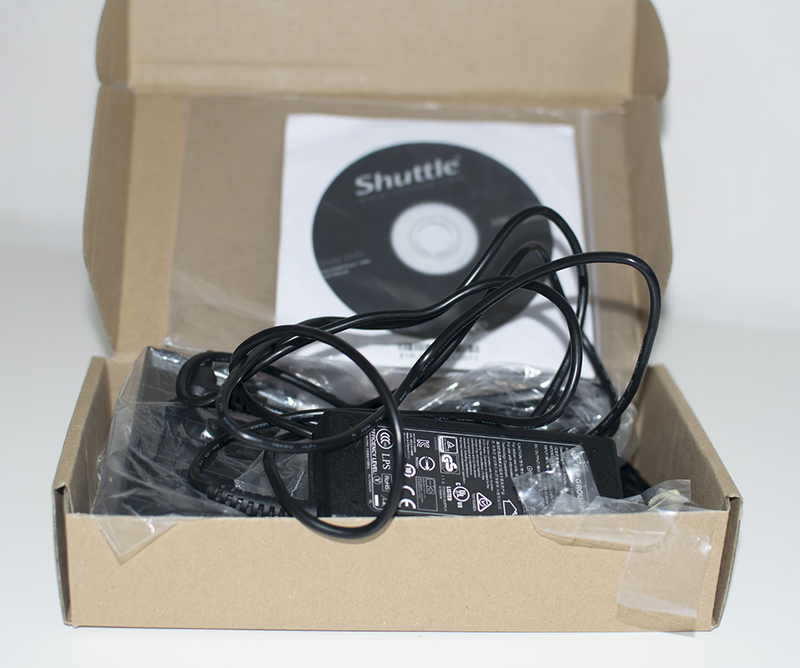 Aside from a mini DisplayPort input, Shuttle have also included a HDMI 1.4a port which is a more widely used connection overall. A singular RJ45 Ethernet connection is present although the Shuttle NC01U5 features a dual internal antenna 2230-AE WAN networking card so using Wi-Fi isn’t going to be an issue with this system; some like myself however prefer to use devices wired to avoid wireless signal dropout. Also present aside from the power cable input is a 4 pole 3.5mm audio combo port which supports a headphone and microphone; a great space saving idea? We think so! In addition to this, there is 2 x USB 2.0 ports which further adds to the units USB real estate. Accessories wise, the Shuttle NC01U5 XPC Nano comes with a plain brown box which is filled with goodies; some extras and some required to make the barebones useable. Firstly, we have a driver installation CD which can be useful, but you will need to either transfer the files to a USB stick to use, or of course plug in an external CD/DVD drive. Also included is a stand which allows for use on your desk without leaving it flat on its back; having it standing encourages a good airflow which helps keep this low powered system cool, not that it should need much help. 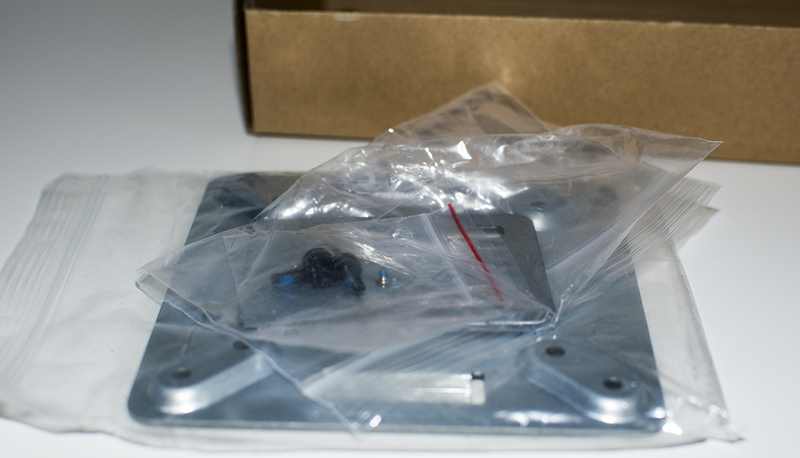 Also included are some VESA mountable plates to attach it to an existing mount or onto the back of a compatible monitor and a laptop style power brick designed to provide power from the mains to the unit. 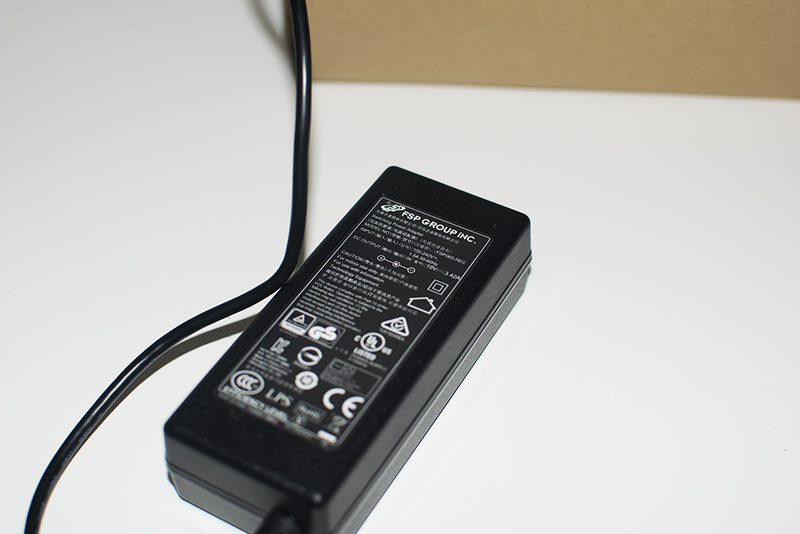 Upon closer inspection of the power brick, Shuttle have gone with a nice and decent quality FSP unit which of course is 240v; it wouldn’t work in the UK otherwise, well certainly not without a power inverter. The stand included is a nice touch and although the Shuttle NC01U5 commands a pretty high price due to the nature of the product, the accessories go a long way in ensuring the usability and usefulness of the XPC Nano system we have here. In my opinion, the system looks absolutely brilliant when inside the stand, but I’ll let you judge for yourself! Let’s take a quick look at the specifications of the barebones as it comes from retail and then we can pop the hood, install some components and get the testing underway!